A beloved British classic perfect for a comforting Sunday dinner. 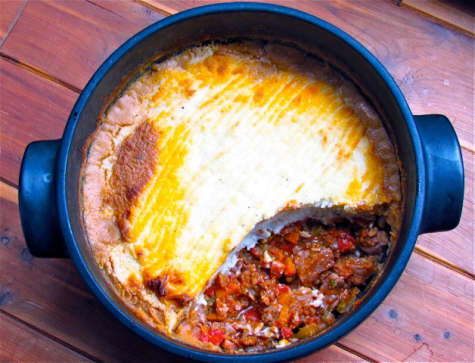 This shepherd’s pie combines the earthy flavour of lamb with rosemary, thyme and russet potatoes. Look for those tastes in a wine- earthy and herbal with dark cherry and plum flavours. A terrific match would be Liberty School Cabernet Sauvignon 2009 from Paso Robles, California. In a large oven-proof pot or Dutch oven, heat the olive oil over medium high heat. Add the bacon pieces and cook about 5 minutes. Add the cubed lamb and cook until browned all over, about 10 minutes. Using a slotted spoon, remove the lamb and bacon to a bowl and set aside. In the same pot add the diced onion, celery and carrot and cook over medium high heat until starting to soften, about 8 minutes. Add the minced garlic, thyme and rosemary and cook another minute until fragrant. Add the tomato paste, stirring constantly, and cook until the paste starts to caramelize. Add in the red wine, scraping any browned bits off the bottom of the pot. Continue to cook until most of the wine has evaporated, about 5 minutes. Add the beef stock, bay leaves, diced tomatoes and salt and pepper. Stir to combine and bring the mixture to a simmer. Return the browned lamb and bacon to the pot. Continue to simmer 5 to 10 minutes or until thickened slightly. Remove from heat. Meanwhile bring a large pot of water to a boil and add the diced potatoes. Continue to cook until they are very tender, about 25 minutes. Drain off the water and mash the potatoes until there are no lumps. Warm the whipping cream and then slowly whisk it into the mashed potatoes with the melted butter until very smooth. Season with salt and pepper. Spoon the mashed potatoes over the lamb filling, spreading to cover the entire surface. Lightly drag the tines of a fork across top to create ridges. Bake the shepherd’s pie at 400 F for about 45 minutes. The top should become golden brown and the filling bubbling at the edges. Allow to cool at least 20 minutes before serving.